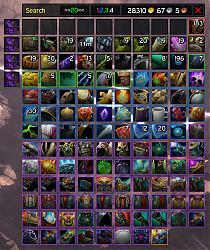 One Bag addon updated and extracted from DerpyUI. Quality glow around the icons not on top of them! Displays the original Bags when klicking on the bags at the left side. When moving windows the buttons are faded out. This is helpfull for low CPUs! Everyone has permission by Hungtar to edit Stuffing! Thanks to Syncrow for helping me fix some errors with Legion Prepatch! Working good man thanks. 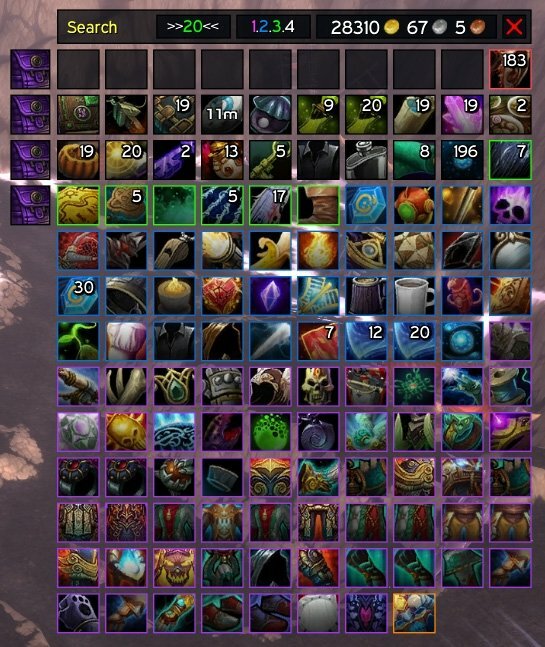 is there any way you can put the new items you pick up glow in like the wow bags do. Oh! Thanks, I guess I missed that in the list. Could we please have the option to lock the bags and bank in place, please. Hey Humfras, lange nix mehr von dir gehört. Wirst du zu legion mal wieder bei wow vorbeischauen ? clink = "|cffa335ee|Hitem:17622::::::::100:258::14::::|h[Satinmantel des Kriegsfürsten]|h|r"
I removed many old files in the latest version that were hopfully not used anywhere. Tested it but if you get any error please report! Nach dem einloggen: Taschen lassen sich nicht bewegen / die item slots werden nicht angezeigt. Last edited by Tonyleila : 12-09-14 at 10:46 AM. 1x [ADDON_ACTION_FORBIDDEN] AddOn 'DerpyStuffing' hat versucht die geschützte Funktion 'UseContainerItem()' aufzurufen. Last edited by Tonyleila : 12-01-14 at 09:43 AM. Wenn du gestern besser gelesen hättest: Das ist das Verhalten des StandardUIs bei aktivem Materiallager. Last edited by Tonyleila : 11-10-14 at 08:17 PM. I tend to play on a larger screen, so i had to scale the bag up-how do i scale the size of the item border which tells the item quality? Last edited by Cerxen : 01-09-14 at 02:47 AM.